Stephen Hawking (Eddie Redmayne) is working on his doctorate at Cambridge. He is searching for a single, elegant equation that explains everything in the universe. While at a party, Stephen meets Jane Wilde (Felicity Jones). Jane is a literature student and essentially represents the opposite of everything Stephen believes. The two eventually begin dating and falling in love. When Stephen is diagnosed with Lou Gehrig’s disease. As his body slowly begins to fail him, Stephen’s primary concern is that his mind won’t be affected. Jane vows to stand by Stephen as he goes through the slow decay. After having 2 children, Stephen and Jane realize they need help to take care of Stephen and the children. They decide to hire Jonathan Jones (Charlie Cox), the choir director at Jane’s church. Jonathan immediately bonds with the children. He also doesn’t hesitate at all with assisting Stephen in any way necessary. As Stephen battles his disease, Jane and Jonathan get closer. Stephen, traveling more and more frequently to various speaking events, takes on Elaine Mason (Maxine Peake) as his personal caregiver. Stephen and Jane must learn how to deal with their now 3 children and the new people in their life, as well as the increasing demands on Stephen’s time. 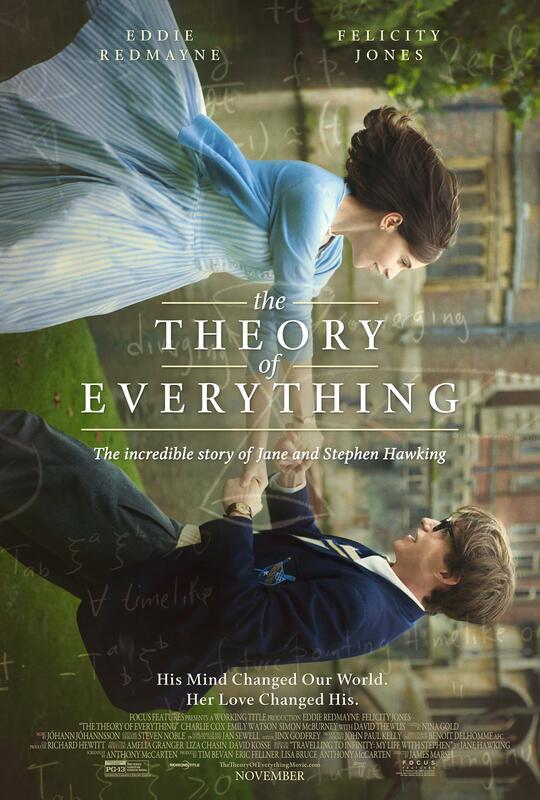 The Theory of Everything gives an insider’s look at the relationship between Stephen and Jane Hawking. Eddie Redmayne must be commended for his portrayal as Hawking. Both while he is a young, able-bodied doctorate student and a disabled young man and adult. Eddie delivers a convincing performance as Hawking’s body deteriorates. From small things, like the way he holds his hands, to the way he delivers his lines, Redmayne never falters. The rest of the cast is solid, if replaceable. Previously, I only knew a small bit about who I had heard was the smartest man in the world. While it is definitely an interesting story being told, there is little more than that. The pace is slow and a bit boring. It plays more of a documentary on this man’s life. From an educational standpoint, it is worth a watch. I would definitely recommend waiting until it is available to rent.